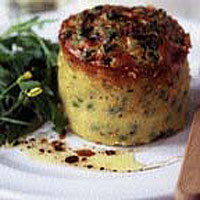 This is an adaptation of a lovely sweetcorn timbale recipe from The Greens Cookbook (Bantam Doubleday; £19.99), a great resource for delicious, meat-free dishes. These dense little egg cakes are quite substantial: they make a generous starter with a tomato or rocket salad, or you could add new potatoes to make a main course. Heat the oil in a large, wide frying pan over a medium heat. Add the onion, season well, and fry gently for 10 minutes until soft and golden. Add the courgettes and garlic and cook, stirring regularly, until the courgettes are completely wilted (15-20 minutes). Make sure any liquid that they release evaporates. Stir in the peas and herbs, cook for a minute or two more, then take off the heat and set aside to cool slightly. Preheat the oven to 180ºC, gas mark 4. Butter 4 x 200ml-capacity ramekins and line the bottoms with discs of baking parchment. Coat the sides well with the breadcrumbs. Discard any excess crumbs. Lightly beat together the eggs and cream and stir in the Parmesan. Season lightly and add the cayenne. Mix the egg mixture and the pea mixture and spoon into the prepared ramekins. Place in a baking dish and pour in boiling water to come halfway up the sides of the dishes. Bake for 45 minutes or until golden and firm, remove, and leave to rest for 10 minutes. Run the tip of a sharp knife around the edge of the timbales, tip out then turn the right way up again so the golden tops are uppermost. Serve warm.